What does it mean to be British? If the new Georgians Revealed exhibit at the British Library is any thing to go by, then it is culture, commerce, and industry. The exhibit, like the Georgian era, lavishly depicts life during the 18th and 19th centuries. Taking viewers on an extravagant tour where they will learn where “British-ness” came from. “The Georgians made us who we are,” says Moira Goff, curator of Georgians Revealed. “And of course tea!” She said with a laugh. She was not the only one to make these distinctions. Lupita Flores, 27, from America said that Britain was and is a fashionable place. It appears that the Georgians really have left their mark, on contemporary British society. Many of the iconic and most loved buildings in London were built during this period. The grand neo-classical architecture of the Bank of England; Regent’s Street and Park; the museums and libraries; they all are Georgian. And it is not only physical monuments that remain. They quite obviously left their mark on the many behaviors and habits that are seen as quintessentially British. New ideas about philosophy, fashion, and taste along with polite social etiquette started with the Georgians. Their thirst for entertainment was nearly insatiable. All things fine and beautiful were sought after. An explosion of operas, plays, and ballet filled the many theatres. But the Georgians, like us, were also curious about the foreign, strange and even weird. Tricks and illusions, the bizarre and grotesque, all of this attracted the crowds. This is the era where the modern circus got its start. Much of our modern culture shares this appetite to be entertained. Only the venues have changed, if just a little. Instead of sideshows and circuses, we have Ripley’s Believe It Or Not! or Madame Tassauds. Venture off the beaten trail and modern Londoners can find the strange and wacky just like their Georgian ancestors. “Fashion became essential,” Goff says. A culture of vanity began, and every proper Georgian kept up with the trends, and if possible a little ahead. This is not so very different our fashion savvy culture of today. 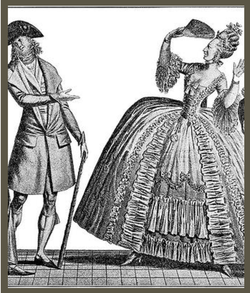 It can be argued that the first modern fashion craze began with the Georgians. Both ladies and gentleman’s magazines were filled with the latest and hottest trends. So did the Georgians leave as strong of a mark as Moira Goff claims? It appears so. The evidence is everywhere after all. Next time you have a cup of tea be sure to tip your hat to the Georgians. They made it a social necessity after all.